In 1752, the Punjab was transferred to Ahmed Shah Durrani by the weakened Mughal rulers of Delhi. The Afghans could not successfully control these far flung areas from Kabul, so local governors were appointed to administer the territory on behalf of the Afghan rulers. In 1758, Raja Ghamand Chand was appointed Nazim or Governor of Jullundur Doab, he died in 1774 and was succeeded by Tegh Chand, who died only one year later in 1775. Nine portraits of Raja Tegh Chand of Kangra are recorded by Archer in Pahari Painting, London, 1973, vol. I, p. 249. The present portrait is a new addition to this small corpus. 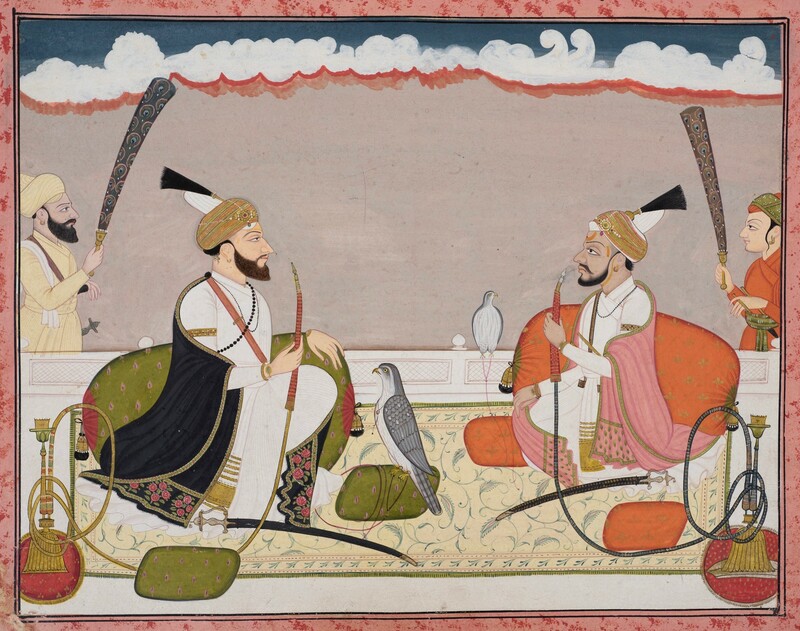 The style which is somewhat unusual for Kangra portraits, suggests that it may have been executed in the neighboring state of Mandi with whom Tegh Chand had close relations, having granted asylum to the Mandi ruler Surma Sen, who is also depicted, and is seated opposite him.